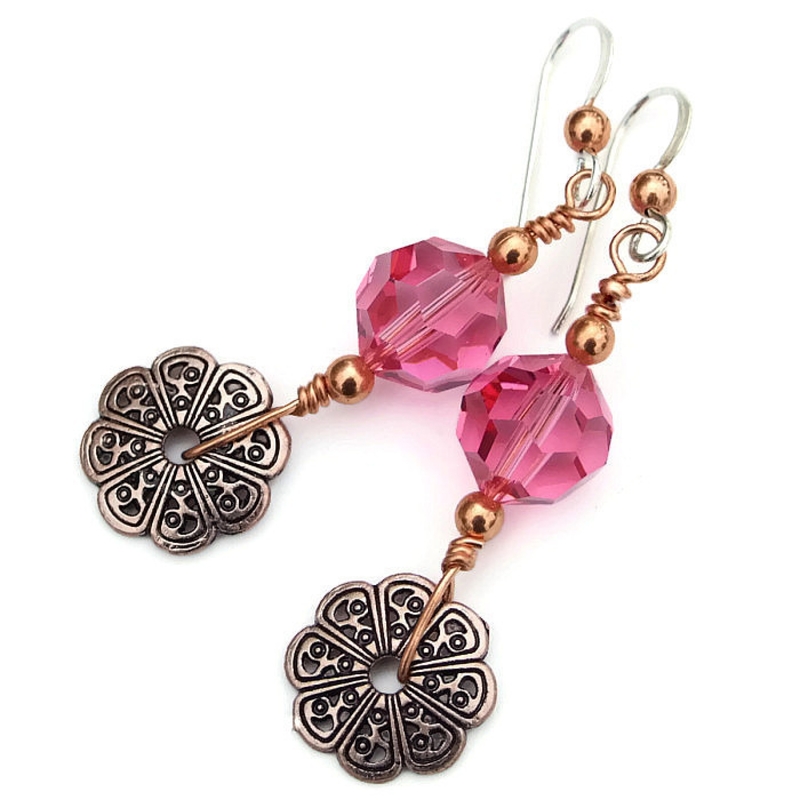 The copper filigree flower charms used in the IRRESISTIBLE artisan earrings are ones I absolutely love. 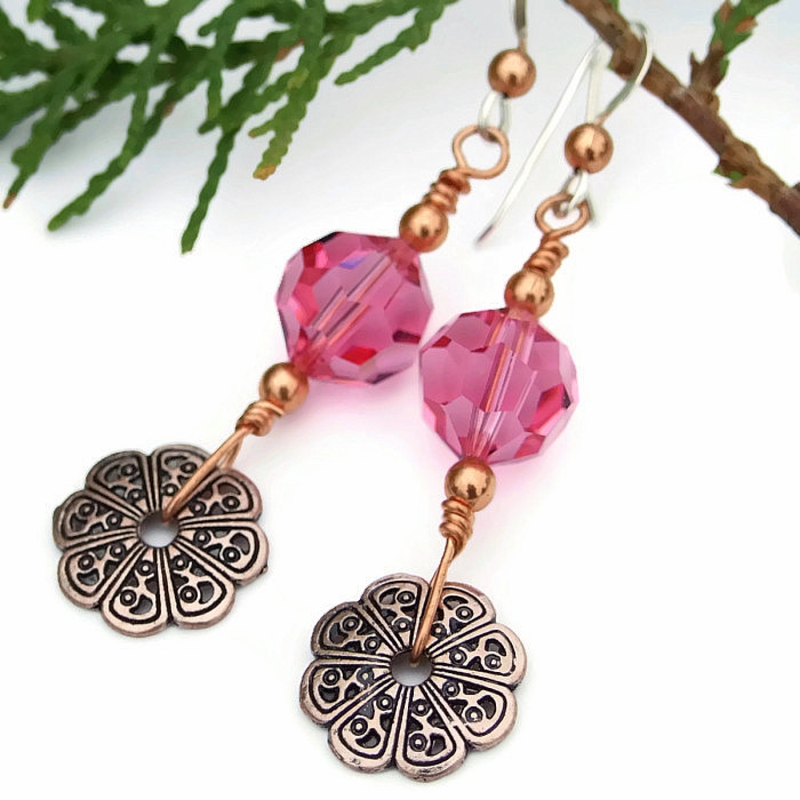 Their unique design with the hole in the middle make the earrings superbly eye catching. Just look at their exquisite detail! The copper floral charms were lightly oxidized and then polished, highlighting the recessed areas dark to play off the shiny areas. This makes the swirly filigree design stand out beautifully. The charms are slightly domed and are smooth on the back except where the filigree holes come through. When worn, the IRRESISTIBLE earrings have a lacy look because of the filigree. The IRRESISTIBLE handmade earrings needed a huge boost of sparkle, so I added Swarovski crystal rounds to the design. 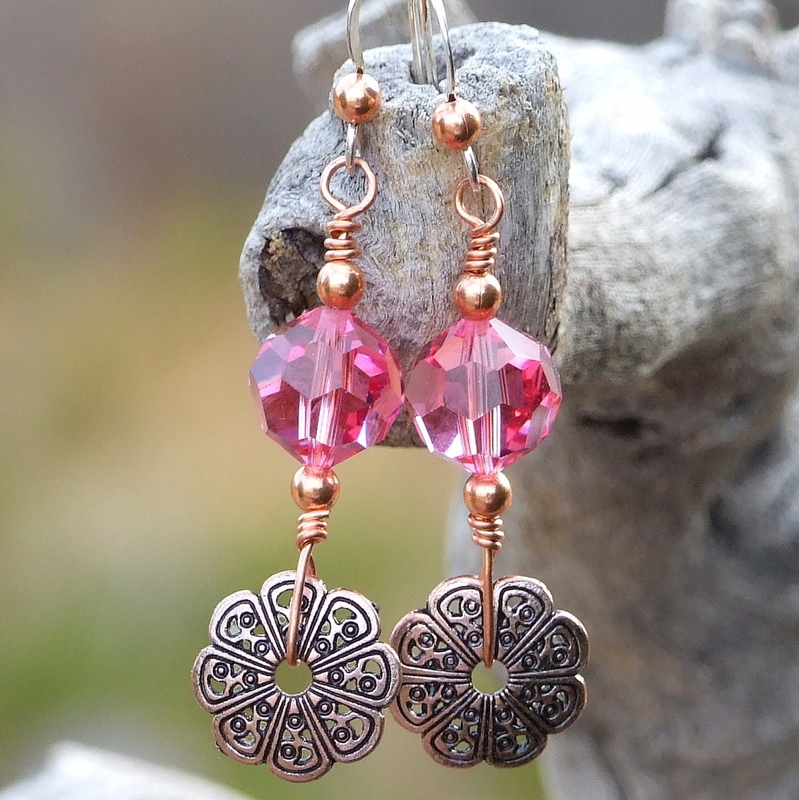 Because I love pink and copper together, I chose an 8 mm medium pink color called “rose”. Founded in 1892 in Austria, the Swarovski company has manufactured crystals that are considered the standard by which all other man made crystals are judged because of their exact facets and impeccable polish. Their sparkle and flash is astounding, as you will see every time you wear the IRRESISTIBLE earrings! Copper 3 mm beads were added to the top and bottom of each pink crystal to act as a frame. 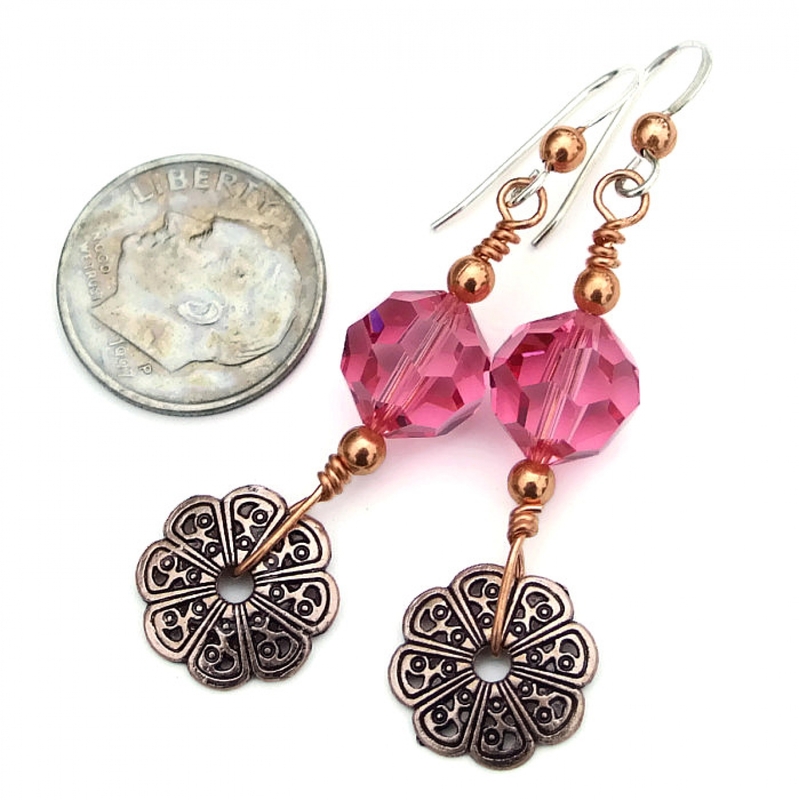 The main body of each earrings was strung on pure copper wire, the bottom part carefully wire wrapped to the copper flower charm. The top part was wire wrapped into a loop, which was then connected to sterling silver French hook earwires. A copper 3 mm bead was added to each earwire to marry the two metals together for a perfect finish to the IRRESISTIBLE earrings. For a better understanding of the relative size of the IRRESISTIBLE earrings, please be sure to check photo #5 for a size comparison with a dime. Glass (manmade crystal)) carries the energies of transformation, rebirth and communication. Copper is said to allow the wearer to recognize barriers in the path of personal development. Silver is a metal of love and healing; it is a mirror to the soul, helping us to see ourselves as others see us. 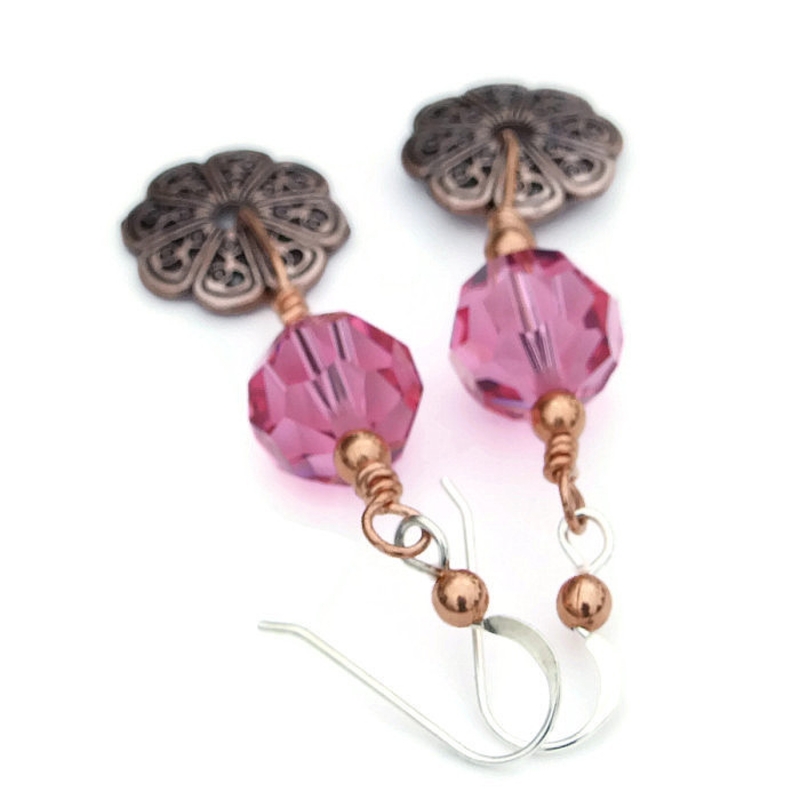 The IRRESISTIBLE earrings will be carefully packed in an organza jewelry bag, perfect for gift giving to a loved one . . . or to yourself!